The "fan favorite" is the yard enforcer. It has more reviews, and more positive reviews. However, to solve my issue with critters in my yard, I used the Scarecrow. They vary wildly in price from year to year, so see both and compare current prices. 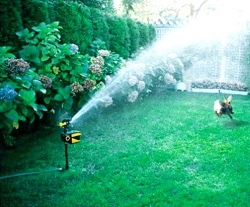 Whichever one you choose, a motion activated sprinkler was a humane, and hilarious way to train my neighbor's cats to do their business elsewhere. Below, you'll see video proof that they work on all types of animals, including deer, dogs, and raccoons! I became interested in motion sensor sprinklers started just about a year after I moved into my current home. After just a few weeks living there, I quickly found out that my yard was a communal toilet for cats. 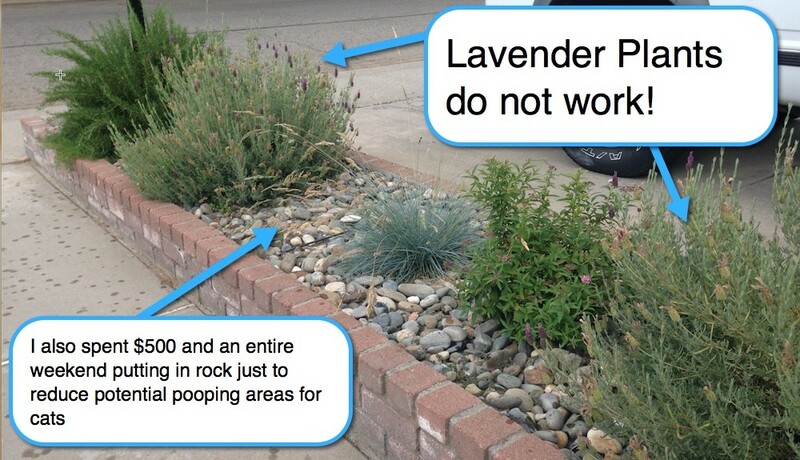 I started with planing cat repellant plants, namely lavender. That didn’t work, so I moved on to the next idea. I bought a round up sprayer and mixed a solution of rosemary oil and water, another supposed smell that cats hate. Nothing. Then I mixed the solution it with bhut jolokia powder, one of the hottest peppers on the planet, hoping to burn their asses (or at least their paws). When that didn’t work, I bought special anti-critter spray, but results were hit and miss. Desperate and out of ideas, I covered all my flower beds, barked areas, and any soft ground with bird netting raised on stakes. I’m not even joking, the cats would actually find ways to get under the netting. Those cats that didn’t want to fight the net just pooped right on the lawn. What kind of cat poops on a lawn? This was no longer funny. Where were all these cats coming from? Of course, there was a neighborhood idiot that was feeding the stray cats in the area. They would have a nice full meal across the street, then come take a big dump at my house a few hours later in the middle of the night. This was a huge problem for me. The second I would step out of my house every morning I’d get a waft of stinky cat crap slapping me in the face. It was also winter, so the moist air would just melt the piles of poop into my lawn so that I literally had to scrape the crap, along with my grass in order to remove it. Then I would have to hose everything down. Ugh. It still disgusts me to this day. Before resorting to more extreme measures like capturing them and dumping them in the next town, I browsed some forums and found that there were motion sensor sprinklers that connected to the garden hose and would actually activate when any critter would come within range. 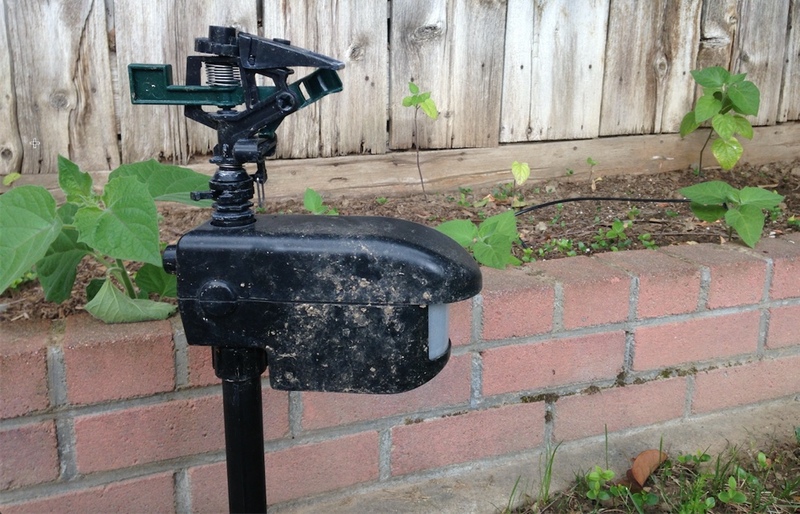 I bought one Contech Scarecrow Motion Activated Sprinkler just to test out how it worked. Well, it worked as advertised. Unfortunately, with setting it up to spray my lawn but not people when they walked by meant that I could only cover half the lawn. I also noticed that the cats were smart, and just started pooping in the back yard…right under my bedroom windows. It was almost as if they knew what was happening and were trying to get revenge. So then I bought three more motion sensor sprinklers. Two for the font yard, and two for the back. My entire property was a secured like one of those laser sensor rooms you see in the cartoons that protect the rare diamond at the museum. Nothing could take a step in my yard without getting sprayed. It’s now been 2 months since I removed the sprinklers and I’ve only found one pile of poop, which was from a different neighbors dog (Geez, what kind of town do I live in?). No cat trouble though. I guess they decided to take their business elsewhere. 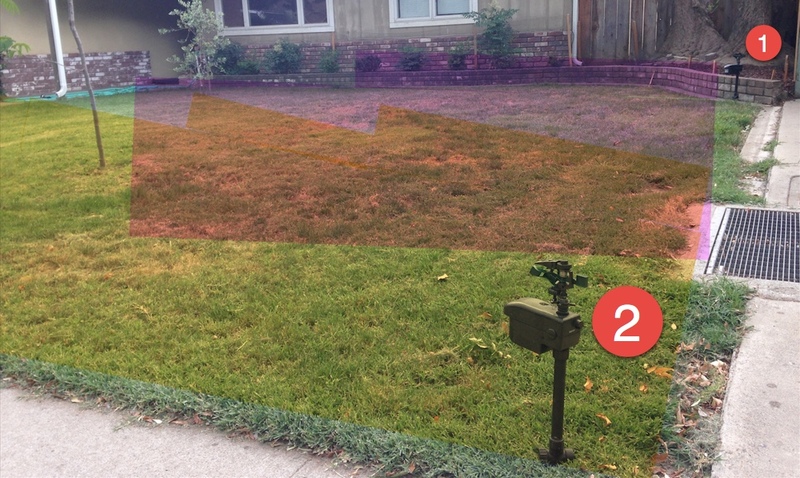 Do motion sensor sprinklers work? Absolutely. Not only do the provide immediate relief from critters and the satisfaction of having a reliable tool against them, but animals are smart enough to learn that your property is no longer their territory. 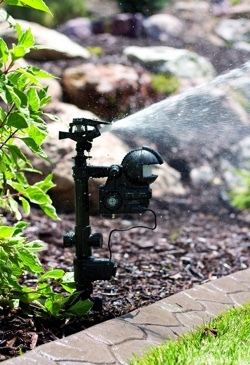 Using a motion sensor sprinkler for a short period of time may be enough to provide you with long term results. 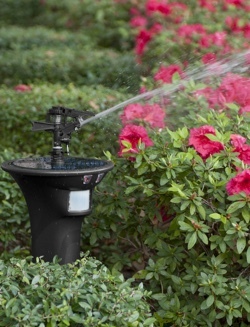 Take a look at the top rated motion sensor sprinklers available online. There are a variety of brands, each with unique features and customer reviews. My personal favorite is the Contech Scarecrow because it was most reasonably priced, made of high quality material, and just plain worked. 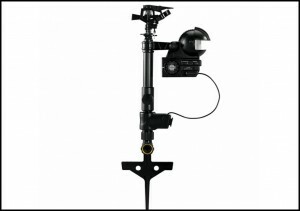 You can see my full review of the Contech Scarecrow for details on what to expect and tricks I learned while using it. Update: I now recommend the Orbit Yard Enforcer because the scarecrow has TRIPLED in price recently, selling for more than $150! The Best Motion Sensor Sprinklers! Though the images above were from the Scarecrow (featured below, rated #2), I’ve chosen the Orbit 62100 Yard Enforcer as my #1 choice for keeping critters out of your yard. There are 3 solid reasons for why I’ve chosen this brand and model. 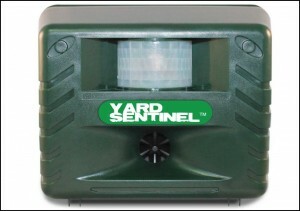 The exact price I can’t post here because of Amazon’s rules (prices fluctuate), but the price of the Yard Enforcer is average and comparable to other models. 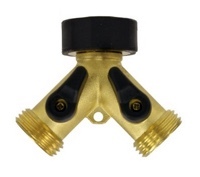 One of the top complaints about motion sensor sprinklers is that they leak or that the thread on the hose connect break over time. 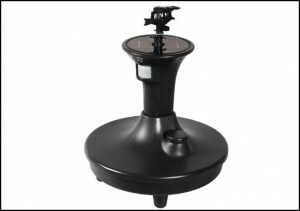 This is not an issue with the Orbit models as they are made of thicker plastic and metal parts. 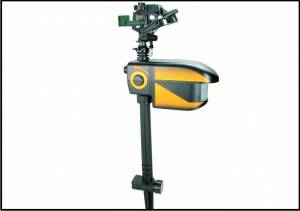 Below is a video showing this model in action! 4/5 stars from 244 reviews on Amazon! Get The Orbit 62100 Yard Enforcer! First of all, it’s the most popular model out there. Of all the review videos on YouTube and product purchases on Amazon, the scarecrow is clearly the most famous model of critter deterrent, used on cats, deer, raccoons, and birds. There are currently over 3000 reviews on Amazon with a 4/5 star rating! That popularity may have been due to a price advantage which it no longer has. I purchased four units for about $50 each (with free Prime shipping), which was the cheapest one on the market in December 2014. However, the listing price from 3rd part sellers is now over $100+ shipping which makes it one of the most expensive models! 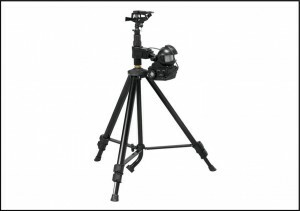 Even on the Contech website the unit is sold for $79.99 + shipping (which is about average). Also, I read several comments from customers that purchased both the Contech and Orbit models stating that the construction material for the Orbit was much higher quality. I am very happy with the four I’ve purchased due to ease of use and effectiveness. However, due to issues with pricing an availability, I’m going to list an alternative for my #2 choice below this one. In the meantime, here’s a video of this model in action! 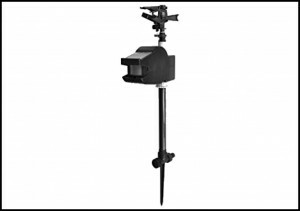 Get The Contech CRO101 Scarecrow! Due to issues with getting the Scarecrow at a decent price, I’ve chosen a similar model as an alternative. This is a cheaper alternative to the Orbit as well. It’s actually only about $10 cheaper if you are a prime member (no Prime shipping for this model). This model also has mixed reviews, with only 3 stars of 241 reviews which is still pretty good. Not a great rating spread, but there are a lot of buyers, some which gave it a 4 or 5 star rating, so some people are having success with this. The biggest complaint I read is issues with the sensor, sometimes causing the sprinkler to go off when no animals were around. This happened from time to time, especially on windy days, with my Contech Scarecrow, and it can be really annoying. However, when comparing ratings, keep in mind that most models of motion sensor sprinklers have a 3-4 star rating. (Yard Enforcer and Scarecrow the only two models with 4/5 stars). Another disadvantage is that there is also no out port if you want to put multiple units on a single hose. Supposedly there is a heat sensor on this one, but I doubt that it will work better than the motion sensor portion (also used here). 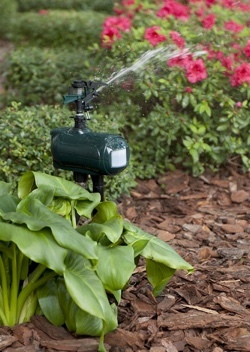 In all, I think the number of disadvantages to this model outweighs the money you save (only $10-$20), but it is the third most purchased motion activated sprinkler on Amazon and second or third most reviewed on YouTube. Check out this video to view the Havahart 5266 Spray Away 2.0 in action. Too bad it’s on a dog and not a raccoon or cat, but you can see that it works. Get The Havahart 5266 Spray Away 2.0! The Havahart Spray Away Elite II Hose-Free is currently the only model available that functions without needing to be attached to a hose! 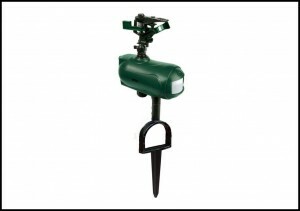 This means it will be perfect for areas of your yard where a hose doesn’t reach, or you want to be able to easily move the unit to different places (keeping unwanted visitors on their toes!). 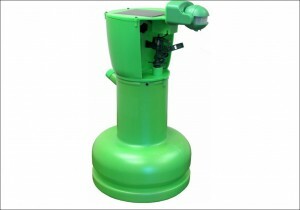 This unit is also solar powered, meaning you won’t have to spend money or time on battery changes. However, it also means you’ll need to place it in a sunny spot to charge. There is a 3.5 gallon tank that you can fill with water before putting it in the desired spot. If you find that cats or deer only come in your yard from time to time, maybe a few times a night, you could get a full week of use before needing to refill. 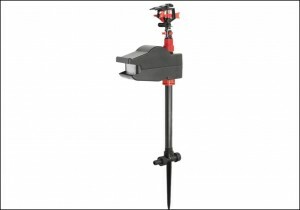 But if you place it in the front yard where cars or people going by can also trigger the motion detector, you may have to fill it more frequently. With 3.5/5 stars and 111 reviews on Amazon, this is a pretty good rating as well. Customers are clearly happy with their purchase. However, it’s on the pricey side, and about double what any other model costs. Want to see it in action? Check out the video below! Get The Havahart Spray Away Elite II Hose-Free! Each of the unites listed above comes with everything needed to function properly except batteries. However, everyone will have a different setup in their yard, and here are few accessories you might need to customize your anti-critter home setup. If you want a hose ready for normal lawn and garden needs without needing to attach and detach your sprinkler hose every time, a 2-way (or more) hose splitter will make your life easier. I found that the flat washers that came with my Scarecrow did not effectively prevent water from leaking. The round washers I got online worked wonders, and I also replaced all my other hoses with these because they worked so well. They are plump, so it does take a few extra turns to squish ’em down, but they work fantastically. 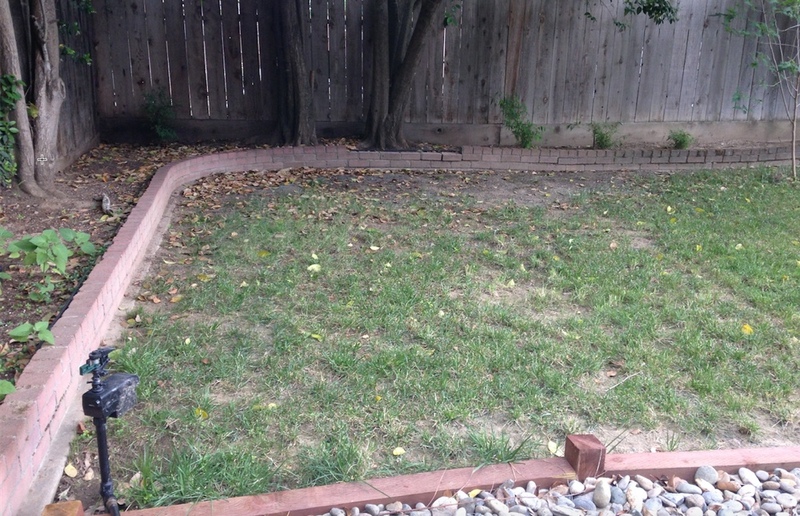 I linked two sprinklers together (Yard Enforcer and Scarecrow have this feature) using a short garden hose between them. The upside is that you don’t need a second hose and a 3 way hose splitter at the faucet. The downside is that if both sprinklers on the same chain go off at the same time, you don’t get full spray capacity. Garden hoses come in as short as 6 feet. This one is hose free. I’m getting ready to set up Orbits for my lawns in town. Cats fearlessly poop everywhere! Lg chunky woodchips became a favorite spot! I spread Lion P and will see if that helps. I have toddlers so spikes, nets, rocks etc are not choices. For deer: they learned that if they set off the Orbit they could come back and grab a few bites before it would go off again but it saved our plants from being decimated. We’ll see how all those pooping cats cope.